In the past couple of years, Converse has developed a “Create Your Own” chucks feature where you can custom order a pair of high top or oxford chucks to your exact specifications. You can create a design from scratch or certain models can be customized. 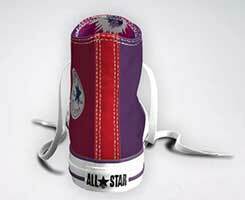 Customizability is one of the many reasons why the Chuck Taylor All-Star is such a versatile shoe. 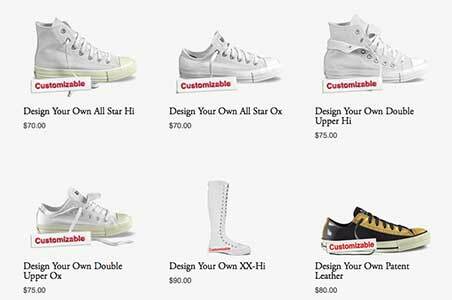 Converse’s custom page has dozens of new options to add to its impressive customization features. 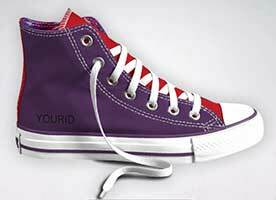 Here are some of the options you have to design your own personal pair of chucks. Once you click on the model that you would like to design, you are taken to a screen where you go through an entire series of options. For example, to design a high top you start with the choice of inside and outside body, which refers to the canvas uppers. You can choose from twenty-three different colors or six patterns. So you could create a standard looking high top or a multi-color high top like the tri-color or 2-tone chucks that were made in the past but no longer available in seasonal issues. Next you choose the color of the spine, that back strip of canvas that holds the inside and outside uppers together. The tongue of the shoe is next, so you could have as many as four different colors or patterns on your sneaker. You also have a choice regarding the inner lining of the shoe. Normally this is an off white color on classic and most seasonal colors, but here you can choose from the twenty-three colors and six prints that can be the outside canvas colors (off-white is a choice). Next is the rubber sidewall and the toe bumper which you can get in white, off white or black. The rubber racing stripes, those thin strips of rubber that runs along the sidewall and around the toe cap can be chosen from a selection of a dozen colors. You can also choose what color of metal eyelets you want for each side of the shoe. Finally, you choose the color of stitching that you want from the traditional white, or in the other twenty-two colors. With stitching you only have one color choice, which is too bad, because the classic Chuck Taylor look has white stitching on the canvas uppers, and the color of the uppers on the heel spine. The last element is the personal ID. You have up to ten characters that will be sewn either on the heel or on the outside upper of each shoe. 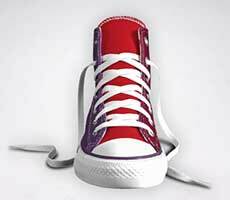 If you have an account at Converse, you can save your designs and order them later. Another really good feature of the “create your own” program is that these custom made sneakers can be made in any size, including half sizes. If you are willing to pay the extra fifteen or twenty dollars for a custom made pair, you can obtain a lot of the seasonal colors that are now only made available in whole sizes. For example, Converse is releasing olive colored chucks for the 2013 season, but only in whole sizes. But olive is a color option for the custom made high tops or low cut oxfords and you can order in half sizes. This is handy for almost core colors like chocolate and charcoal as well, if you can’t get the half size you want. Normally the shoes take two to three weeks to make and ship to you. That in itself is amazing considering that the sneakers are made in China. The custom design program is a great way to express your individuality and make that sneaker design you always wanted or wished you could buy again if you want a seasonal color that may not be currently available. Below are some photos of a custom designed tri-color high top. Front and inside patch views of a custom designed tri-color high top. You are guided through the design process as you see in the right image. Outside and rear views of a custom designed tri-color high top. This design would cost $70 plus shipping and tax. One of the latest editions is the option to customize a pair of Woolrich edition chucks. These wool-lined shoes feature a bold array of 5 different initial patterns to start with. While the wool patterns are great themselves, the remaining options are limited. The majority of the other parts of the woolrich chucks come in 5 simple, dark colors. These include off-white, black, grey, and the new thunder grey. 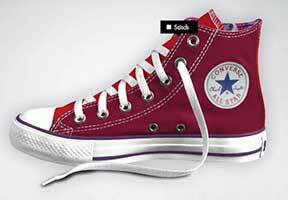 The original chucks, however, still feature dozens of customization options. One of the initial eye-catching features are the 20 print patterns you can choose from. These include animal print, geometric skulls, and various star patterns. Going down to the other parts of the shoe, new colors have been added to reflect the new fall color lines. These options include thunder, eggplant peel, and cyan space. They are available on the tongue, heel stripe and lining, but do not run in the racing stripe, eyelet, or lacing. If you find yourself to be more of a craftsman, there are plenty of ways in which you can spice up your favorite pair of chucks. Watered down fabric paints allow the artist to create memorable designs such as a faded American flag apparel, or Japanese wave designs. Use glue to add more physical features such as spikes, studs, and crystals. Tie-dyeing is a great option as well, as long as you do it right. Other, more ambitious, ideas include making them into sandals (look it up, it can be done) or adding platforms to give yourself a little boost.